In medieval times provision had been made for the isolation of lepers although leprosy, as understood at the time, included any number of other infectious diseases. These leper-houses or lazars were usually founded by the monarch, ecclesiastical bodies or local benefactors. In subsequent centuries, when outbreaks of plague frequently broke out, it became the practice to set apart buildings outside the town called 'pest houses' for the isolation of plague victims. It was only during the latter half of the nineteenth century that the provision of isolation for those affected with infectious diseases became recognised as the duty of local authorities. An outbreak of smallpox in Yeovil during 1870 caused great concern over this serious, disfiguring and deadly disease even though the number of fatalities was relatively small. Some twenty years later a visitor to Yeovil brought the disease with her in February 1893, although in this instance the disease was contained. Nevertheless the Borough Council were concerned enough to commission and speedily erect an isolation hospital. 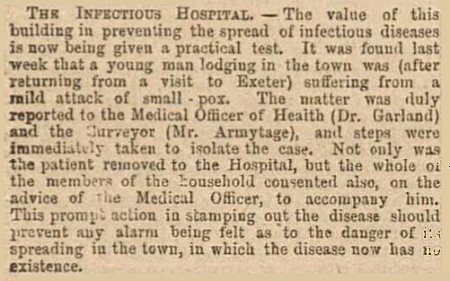 Its first case was admitted in 1895 when a young lad from Exeter, visiting a house in Orchard Street, was diagnosed with smallpox. Fortunately the disease was contained and the boy eventually recovered. Built on a field called Drang (Parcel 871) and surrounded by nothing but other fields, the Isolation Hospital appears on the 1901 Ordnance Survey below as “Hospital (Infectious Diseases)”. It was located on its own, in a small enclosure, a field away from Little Lyde and reached by means of a narrow track - isolation really meant isolated! On the map below the hospital is located right of centre. Pen Mill Station gives a good idea of the location and note too that Lyde Road continues beyond Little Lyde as Lyde Lane. The hospital was built in 1893 by Yeovil Borough Council with accommodation for a caretaker, his wife and four patients. In June 1902 it was recommended that a wash house and mortuary be added to the complex and that infectious diseases other than smallpox should be treated there. When it was built the isolation hospital lay outside the borough boundary but the 1904 boundary extension brought it just within the borough boundary. A serious and potentially deadly scarlet fever epidemic broke out in Yeovil during July 1903, and the hospital could not cater for the large number of patients, chiefly children and young adults, succumbing to this highly infectious disease. The Borough Council discussed either purchasing some Berthon pre-fabricated wooden and iron framed huts or putting up tents for additional accommodation. It was agreed that two Berthon huts (see gallery below) be purchased since they could be dismantled when not needed, and were recommended for use in smallpox outbreaks. The Medical Officer's Report on the Sanitary Conditions of Yeovil in 1904 described the hospital as follows. "The Isolation Hospital, a red brick building, situated 1½ miles from the centre of the town at its extreme east boundary; is 500ft distant from the road and from any dwelling. It was erected in 1893 at a cost of about £400. It contains in its two wards 8 beds; a Laundry, Ambulance and Mortuary block was added in 1903 at a cost of £142; total cost £542. Under pressure of the scarlet fever epidemic of 1903 two decagonal "Berthon Huts" of wood and canvass, each accommodating three beds, and having a central stove, were provided at a cost of £105. The total isolation provision was therefore brought up to 14 beds, at a cost of £647. Again, under pressure of the scarlet fever outbreak of this year (1904), by re-arrangement of the administration block, the accommodation was further increased by 4 beds, giving a total of 18 beds. This arrangement can, however, be regarded as only temporary. As the Berthon Huts are bespoken to provide accommodation for small-pox, should that disease unfortunately - as it has occasionally done in the past - make its appearance in the Borough, it will become necessary to provide permanent accommodation, on the lines of modern construction, at the Isolation Hospital, preferably for at least 12 beds. Isolation accommodation is provided for scarlet fever alone at present. An efficient Ambulance has been recently provided." 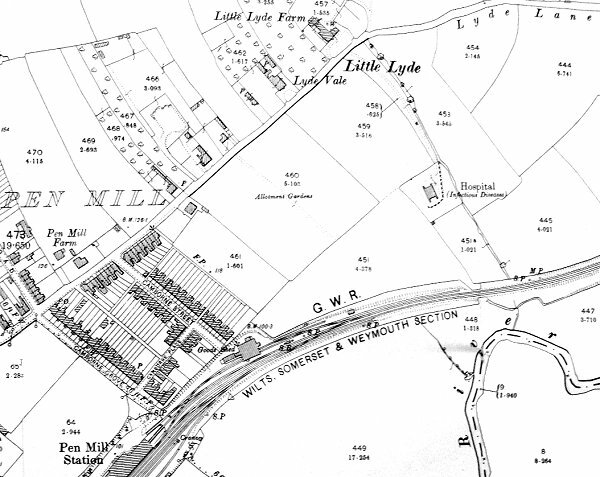 On this 1901 Ordnance Survey the Isolation Hospital is shown at the end of a long track running south from Little Lyde. An item from the 29 November 1895 edition of the Western Gazette - just a couple of years after the isolation hospital - noted here as the 'Infectious Hospital' - was built. 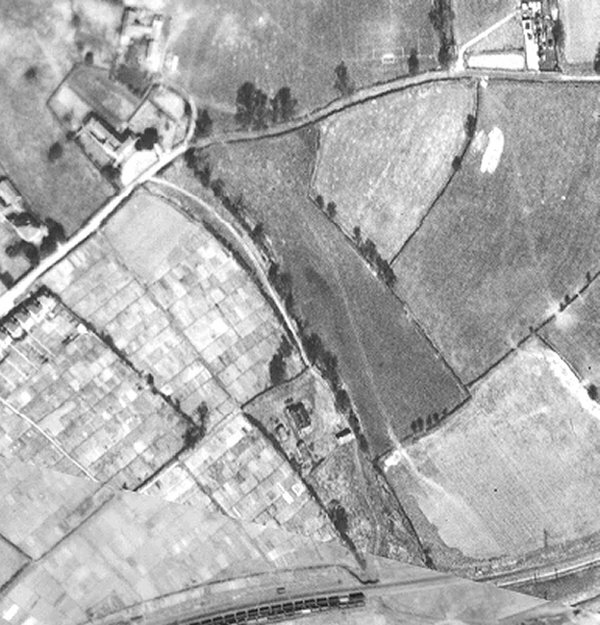 A 1946 aerial photograph showing Little Lyde Farm in the top left corner with the track running south to the Isolation Hospital at lower centre. Note that Lyde Road is not built beyond the farm at this time, note also the huge expanse of allotments at lower left and also the train at bottom. 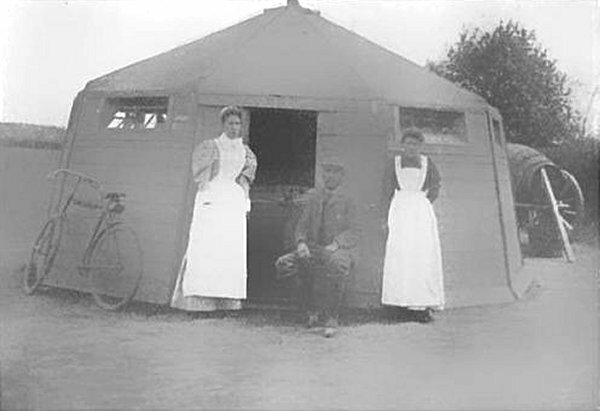 A Berthon hut, two of which were used at the Isolation Hospital. These were manufactured by the Berthon Boat Co. of Romsey, Hampshire. It was a dome-shaped polygonal structure made of wood and in segments such that it could be easily assembled or disassembled. It had a wooden floor that was stained and varnished with a roof made of timbers that radiated from the apex. The covering comprised two layers of canvas made waterproof with flexible paint. The walls were of two layers of match-board with inset glazed windows to each segment and ventilation was by fresh air entering and circulating between the double sides and escaping via vents at the apex. The huts were heated by a slow combustion stove at the centre of the hut with a stovepipe projecting through the apex. The Berthon hospital hut was 18ft (5.5m) across and cost £50.